May 2015 – Tools for strategic and strong-minded thinkers! The nearby graphic is a “before and after,” prepared by workgroup from my How to Think Strategically Workshop in offered a few months ago in St. Paul. (The before is on the left and the after is on the right.) Both of them were developed in response to this question, What is strategic thinking about? In developing the graphics, the groups were given time to brainstorm and asked to narrow them to the top answers. 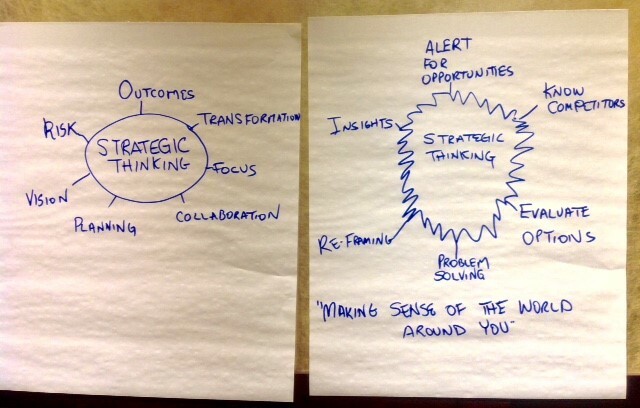 As you can see in the left side “before,” the group answered the question of What is strategic thinking about? with outcomes, transformation, focus, collaboration, planning, vision, and risk. This is a very respectable set of answers, but it could easily have been the answer for the question, What is project planning about? This is typical of many people’s understanding of strategy: it’s mentally categorized alongside the word plan. The word plan connotes the ideas of structure, alignment, prediction, and goals, which distract from an accurate understanding of strategic thinking. The right-hand drawing was after a morning of seminar discussions and presentation. The same team relooked the question of what is strategy about, and came up with a much better set of criteria: Alert for opportunities, know [your] competitors, evaluate options, problem solving, re-framing, and insights. This “after” diagram clearly shows their understanding had become more accurate. I particularly liked how labeled the graphic, “Making sense of the world around you.” That sense-making activity ties closely to the ideas of reframing and insight that are noted on the graphic. A strategic thinker looks at a situation with the intent to clearly and accurately perceive the situation. What is happening? is an important question. Supplementing that situational analysis is a recognition that there are always competitors (or substitutes); strategy is more than a set of aspirations. As the strategic thinker gets a feel for the current situation, there are a two more questions that can energize their minds: What might happen? And What can we do about it?